My mom always tells me to cut down on junk food. I felt like a kid when she found out all the packs of chips I ate in my room's trashcan. She almost asked me to stand in the corner. I assured her I drink lots of water - sometimes even more than 8 glasses. 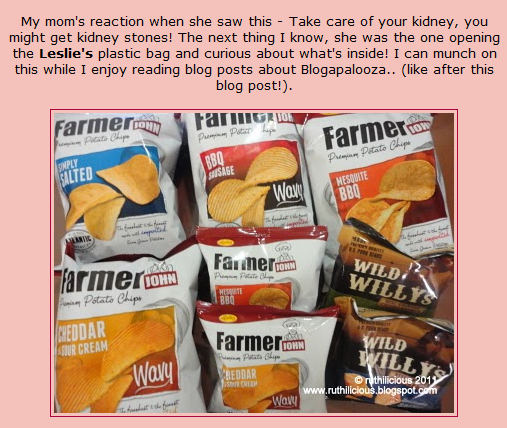 So when I came home from Blogapalooza with a bag of Leslie's items, I thought I would have a good day! I was already imagining myself in my room, snacking on this goodies, watching DVD or reading blogs. But mom is once again playing the antagonist. So it took me a month before I finish the packs (actually I still have one big pack that I cannot open because my mom is guarding it). The first one I tasted was the Simply Salted flavor. Ironically, it is not salty at all, and surprisingly, my mom agreed. We love it too much that I totally forgot to enjoy the whole experience of tasting it. So fast forward after so many days and weeks, I tried the Cheddar and Sour Cream flavor. So first, let's use the Sense of Sight - by the looks of it and packaging, it looks so expensive. I would think that this product is imported if not for the Leslie's logo. The Sense of Touch told me that this is packed fresh. I opened it and smelled the flavor. It is chessy with that hint of sour cream. I can no longer wait but the Sense of Hearing asked me to listened to its crispiness. It is crisp! Like chips breaking in those commercials. I wonder how it would sound when it is inside my mouth?! The shape are all equal and even. There are just few pieces which were broken but I can clearly see that it is made of potatoes. It is even thicker than the usual potato chips I can buy locally. I tasted it and it is a totally different experience. The flavor is like no other. This is a signature taste. Although I still prefer the Simply Salted flavor. Fast forward to more days and weeks, it is time to taste the BBQ Sausage flavor. I have to tell my mom that I need to make a review of this product so that she would allow me to eat chips. OMG! This flavor is the bomb! I love it! I just cannot explain how good it is and different from other usual flavors. I have tasted cheese, bbq, pizza, and others, but this one spells GOOD CHIPS. You see, I was in heaven that I even tweeted about it. God knows I seldom tweet! Then just this morning, I tried the other snack - the Wild Willy's Chicharrones! I was eating lunch and I got too tired of the usual beef and pork meal, that I thought of opening Wild Willy's and eating it as the main dish! There's no need for vinegar, it is well-blended with vinegar; but it is not too strong that it leaves a foul smell in your fingers. You can still hold hands with your lover after eating Wild Willy's Chicharon. And kiss too if you are feeling romantic. My supplies are running low. But at least I know what to grab in the next trip to the supermarket. Have you tasted the Farmer John's and Wild Willy's snacks? Tell me what you think! So now you know what to buy for movie dates, drinking sessions and long road trips!